I hope you had a fabulous weekend. Several years ago I wrote at guest blog post for Small Measure all about worm composting. 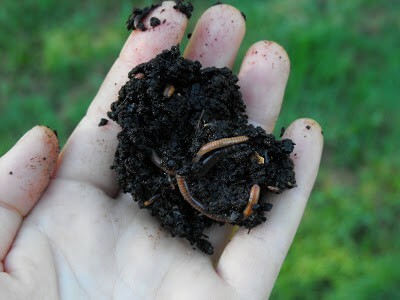 Since we are in the thick of spring gardening and well on our way to a summer harvest I though this information about vermicomposting was still relevant and that some of you may want to try getting a worm bin set up. Read on to learn more than you ever wanted to know about composting with worms. Vermicomposting is a fancy name for composting with worms. When red wrigglers are added to your compost pile, they eat your organic waste and convert it (via pooping!) into beautiful rich compost. Worms will breakdown your compost pile much faster than traditional compost methods. Whether you live on a sprawling farm or atop a city skyscraper anyone can learn how to vermicompost. The set up is easy, takes up little space and will produce compost year round. There are two routes you can take, you can buy or DIY. Don’t like the hefty price tag that comes with pre-made worm bins? Make your own! Making a bin is actually quite simple and inexpensive. You can use Rubbermaid bins with holes drilled into the bottom to create a worm bin. I could get into the specifics but I would probably need to dedicate a whole post for the tutorial. Google, “how to make a worm composting bin” for about a million different DIY options. Place your bin in a cool, dry easily accessible place where the temperature is between 40-80 degrees. The kitchen is usually a great place for your worm bin. If set up properly your bin won’t smell or leak. You’ll be amazed at how fast vermicomposting becomes part of your daily routine. Once you have assembled the worm bin begin by adding your base material. Fill it with a mix of shredded materials like old newspaper and cardboard, leaves and peat moss . 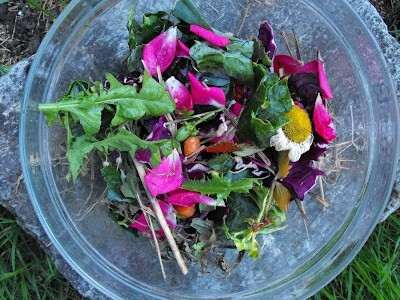 Then add in some food scraps and let it sit for about a week to start decomposing before adding your worms. Worms are likely available at your local garden center. You can also order them online. I actually got mine off Amazon (yes you really can buy everything off Amazon) Now before you go digging up some squirming worms from you backyard remember not all worms are created equal. Some species won’t want to eat your garbage. Also, they may carry disease. For the best quality worms it’s best to buy them from a source that specifically sells worms for vermicomposting. If you know someone with an established worm bin you could always ask if you can have some of their worms. In general you need about 1-2 pounds of worms to start with. When adding your worms for the first time keep the lights on in the room your bin is situated in. Worms don’t like light and will burrow themselves into the compost to hide from the light. The worm population of your bin will self regulate. What this means is that they will only reproduce as long as there is enough space and food to accommodate themselves. Your worms won’t reproduce to the point where the number is out of control but they do multiply quickly. You’ll notice a lot of little baby worms in your compost from time to time. This is a good thing. Veggies and veggie scraps. Didn’t get around to eating that spinach and now it’s wilted and gross? Toss it in the bin. Coffee grounds. Yep, contrary to popular belief worms don’t like coffee nearly as much as we humans do. In fact if you have been adding grounds to your worm bin all the brown stuff you think is amazing worm castings are probably undigested coffee. A little coffee is okay but I prefer to keep it out of the worm bin and save it for my worm free compost and other gardening projects. Too much citrus. Try not to overload the bin with orange peels and lemon rinds. The worms don’t like the acidity. The food mixture should be about 50% kitchen scraps and 50% fiber. As your worms get to work churning out the compost you’ll notice a collection of brown water in the bottom of you bin. This my friends is known as “worm tea” Worm tea has all the nutrients and benefits of compost but in liquid form. Your flowers and plants would love a cup or two of worm tea! You can use your worm tea as fertilizer for you plants. Water your house plants or garden with worm tea and watch them grow to new heights. This stuff seriously rocks. So a few months have passed since you welcomed your new worm friends into your home. You provided them with a safe, dark, temperature controlled home with plenty of food. They kept up their end of the bargain by eating your organic waste and providing you with dark rich compost. A collection of compost has built up but what do you do with it? Once you start gardening with compost you will find you can never have enough. You can add your compost to new or established garden beds or to potted plants. Anything growing in dirt can benefit from added compost. Before you harvest your compost bury a piece of food in one corner of the bin and the worms will migrate towards it. The next day carefully collect the compost and try to pick out worms and place them back in the bin. Help! There are flies and bugs in my bin! A few flies and bugs are normal. 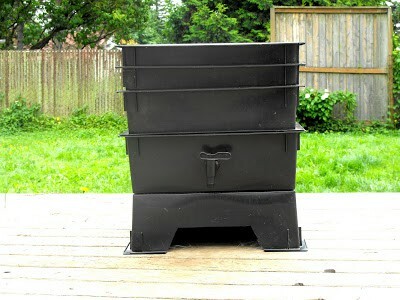 The worm bin is a complex eco system full of different bugs gobbling your decomposing food. If there are suddenly too many and they are a nuisance stop adding new scraps and bury the current decomposing scraps deeper. Oh no! Some seeds have sprouted and there are little plants growing in the bin! Not to worry. Little plants never hurt anyone. It’s quite common for seeds from veggies such as squash to sprout and grow in the bin. You can prevent this by zapping your seeds in the microwave for a minute before placing them in the bin. Yikes, there is moldy fuzz growing on some of the food! Help prevent mold by turning the compost every few days. If there is too much mold it may be a sign you are adding too much food to your bin too fast. My bin is too dry. How do I add moisture? Soak some newspaper in water and ring it out. Place it over the top of the compost. Your compost should be fairly moist but not dripping. The composting matter should have the moisture level equivalent to a damp sponge. My Bin is too wet. How do I control the moisture? Add some shredded paper. Worms need to be kept moist at all times but if it is too wet they may drown. Sniff sniff what’s that smell? If your compost is getting stinky stop adding new material and turn your compost. Try to bury un-composted materials. Once you get your bin set up the maintenance is quite easy. It’s amazing the amount of items you are able to compost and how quickly it will break down. Whether you purchase a pre-made worm bin or make one yourself you’ll find worm bins are not only a great way to create your own compost but also a fun project for the home and a unique way to get kids interested in gardening and science. Are you ready to have worms start eating your garbage?